Every other year, Criminology faculty take students to England and Scotland for a comparative criminology class. The students compare and contrast how law enforcement, the courts, and prison systems in England and Scotland compare to that of the U.S. They also learn about criminal justice history and British culture. Smith, a criminology instructor who spent decades working in municipal and federal law enforcement, proposed a similar program in Bolivia. 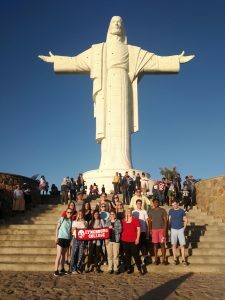 The Lynchburg group at the Christo de la Concordia, or Christ of Peace, statue. Through the Bolivia study-abroad program, students can earn credit for two courses: Comparative Criminology and Intermediate Spanish. “The trip was typically divided with Spanish lessons in the morning and criminology site visits in the afternoon,” Smith said. 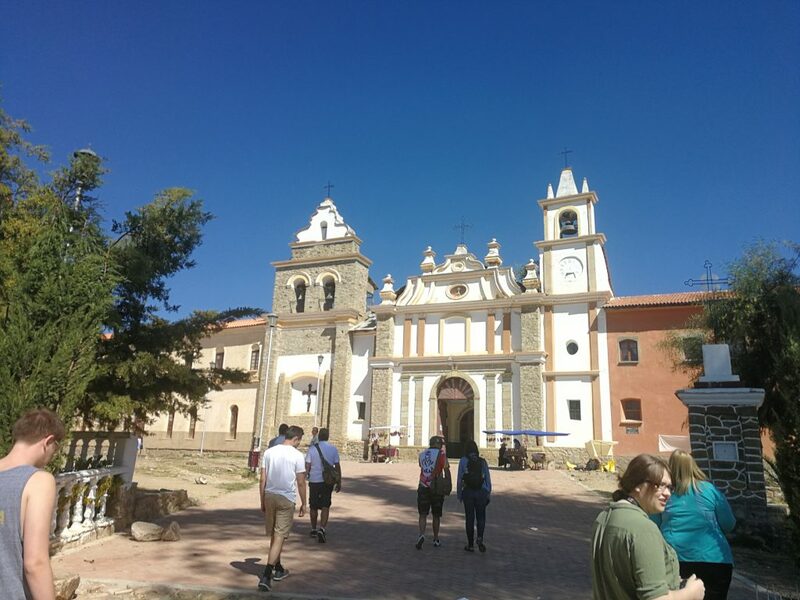 “We were in the city of Cochabamba, Bolivia, besides transiting through the capital of La Paz. “The students went to a variety of criminal justice institutions, including the regional police academy, the forensic lab and morgue, the police K9 school, the police family violence unit, a men’s prison, a women’s prison, the narcotics police station and crime lab, and the criminal court. The Lynchburg group also spent a lot of time learning about Bolivian culture. They visited traditional markets, including the “witches” market, where one can purchase folk remedies and other oddities. They went to a religious festival to watch traditional Incan dances and visited the famous Christo de la Concordia — Christ of Peace — statue. The group attended a barbecue at the home of one of Smith’s Bolivian friends, went to a dance club, toured a mansion, witnessed a political protest, sampled Bolivian and international cuisine, and watched a Bolivia vs. Chile soccer match. Along the way, they also made connections that resulted in a new partnership for the University of Lynchburg. While visiting the Universida Mayor de San Simon, a Bolivian university that has more than 50,000 students, Lynchburg faculty met with officials, including Dr. Omar Morales Delgadillo, the university’s academic director. A few weeks later, when Dr. Morales was in the U.S. visiting his daughter, he stopped by University of Lynchburg and met with President Dr. Kenneth Garren and Dr. Sally Selden, Lynchburg’s provost. During the visit, the representatives of the two universities signed a partnership agreement. “For us, any partnership provides an opportunity for students to study abroad and spend some time there learning the language,” Dr. Selden said. “We’re hoping to have some faculty and student exchanges, probably very similar to our other partnerships. 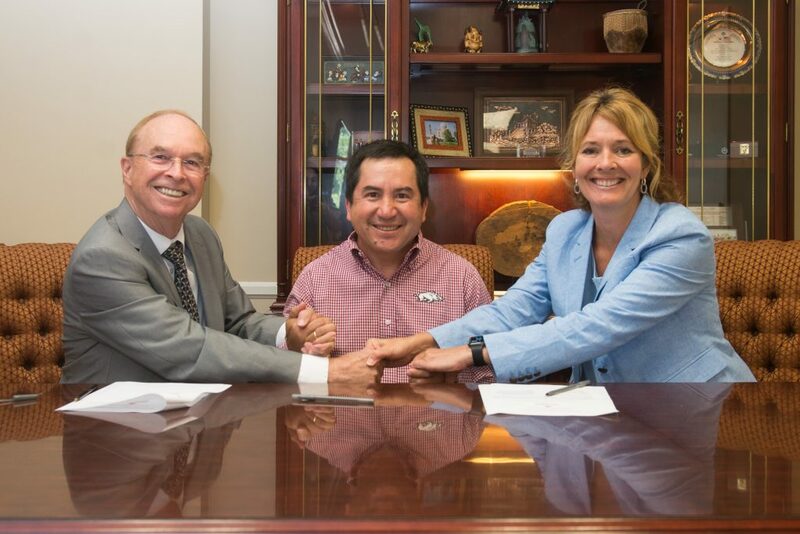 Pictured (left to right) are University of Lynchburg President Dr. Kenneth Garren, Dr. Omar Morales Delgadillo, and Dr. Sally Selden.